On this lovely August day in St. Joseph, Michigan Rebecca & John were married. This couple was a blessing to work with, Rebecca knew exactly what she was hoping for on her wedding. Working with her and john was such a delight, I loved going over details for their special day together! This couple made me remember why I wanted to get into this industry! Check out their gloriously detailed beach wedding below shot by the lovely Clary Pfeiffer! Julie and Daniel got married at the lovely Sojourn Lakeside Resort in Gaylord, Michigan. This was a glorious August wedding, with perfect weather and a beautiful couple to work it. You can tell by the pictures that they are a fun and joyous couple to work with. Check out how spectacular this couples day was below! This was a perfect day for a beach wedding for the sweetest couple. Lauren and Adam got married on the beach and held their reception at The Leelanau School. This wedding was a perfect way to showcase the beauty of Northern Michigan, from their first look in the woods, to their ceremony on the beach looking out onto Lake Michigan, to their reception cozy in the woods. Enjoy these breathtakingly beautiful photos by Cory Weber Photography! Stephanie and Brian were married in the vineyard at Black Star Farms, followed buy the most sophisticated barn reception I've seen! I love how the images from Dan Stewart showcase the joyful and loving energy these two share. Stephanie's dress is one of my favorites of all time. The details and floral are not to be missed. The wedding was also featured on Carats & Cake, click here for the feature! If there was a thing such as a perfect Traverse City wedding, Christine and Joel's nuptials would be it. The ceremony took place un the sun under Building 50 and transitioned to a beautiful outdoor cocktail hour at the Botanic Garden. From there, guests were ushered into the reception with champagne and wowed with the incredible decor inside the Cathedral Barn. Don't miss their exceptionally sweet pup, Louie, and the helicopter exit from the ceremony! zzy and Tom were married on a perfect July day in Northern Michigan. Between the stunning color palette, a glowing sailcloth tent, and these photos by Rebecca Yale... get ready to swoon. I won't say too much. For more insight into the day, check out the feature on Martha Stewart Weddings! It was such a privilege to work with these two on planning and designing their nuptials at The Homestead Resort. They wanted a venue that was really able to show off the beauty of Glen Arbor (those views! ), that their guests would feel comfortable at, and most importantly- felt like the perfect place for them to say "I do!". Be sure to check out the custom calligraphy pieces created by the bride, and check her out on Instagram @wildflourish! Now onto the images by Curtis Wiklund! Get ready for some serious eye candy. 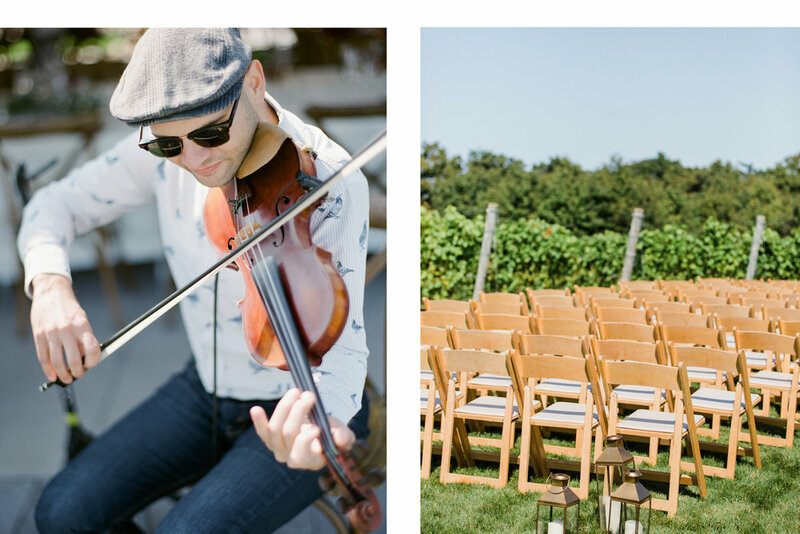 This day in June at Ciccone Vineyards was full of romantic details that set the stage for a perfect Northern Michigan wedding. From the invitation suite to the surprise sunset at the end of the day, you won't want to miss these images by Cory Weber!